New Year’s Eve has always been one of my favorite holidays, but I also think it loses something when you turn twenty-one. While it can be a helluva good time, New Year’s Eve after turning 21 tends to be pretty myopic in focus. Forgotten are the experiences of the past year and the hopes and plans for the new one. Suddenly, it’s all about the amount of alcohol you can pack away in one night to justify the exorbitant cover charge you paid to get in the door and, if you stay just the right amount of not-too-drunk, that midnight kiss from a pretty (you hope) stranger. As goals go, those two aren’t particularly lofty and really do a disservice to what celebrating the new year should be about. What good is a New Year’s celebration if all you think about is that one single, solitary night? See, growing up, my family had a tradition. On the first day of the new year, we’d go out for dinner as a family. My parents were, um… Hmmm. I think ‘frugal’ is the polite way of stating it. We didn’t eat out much, but January 1st merited a meal on the town. That alone made January 1st a noteworthy occurrence. Some years, it was pure Americana – a Perkins or Denny’s or Embers. Other years, we’d go crazy-exotic like La Casita Mexican or the Dragon House for Chinese. Hey, cut us some slack. We’re talking about suburban Minnesota in the eighties and early-nineties, not the East Village in New York or San Fran’s Mission District. We did the best we could with the tools at hand. We would enjoy a good meal, but any conversation was restricted to the meal at hand. There was no discussion of the previous night, the previous week, or any time prior to arriving at the restaurant. Only after we’d packed away our dinner would my dad let the real event begin. And that was all it took. My sister and I would climb all over each other trying to see who could remember more things – what grade we’d received in what class, the best school event or some particularly spectacular shenanigans with the neighborhood kids the previous summer. Meanwhile, my parents would chime in with memories of grown-up things. My dad starting his own business, my mom getting a job at the local elementary school. One year, it was the new car. Another year (the one in which I’d turned sixteen), it was the car I had crashed. If it was one of the rare years that’d we’d been able to take a family vacation, memories and stories from the trip would dominate the conversation. Yellowstone the year it was on fire. St. Petersburg, FL when I was thirteen. Tucson, AZ one Christmas when I was in high school and my parents were fed up with winter. We’d go around the table, sharing memories, some big, some small, but all important or meaningful in their own way. If someone remembered something that the others had forgotten, the rest would oooh and aaah and then start to pepper in their own recollections as they came back. One-upping was highly encouraged and richly rewarded with approving nods and smiles, or even an, “I’m impressed you remembered that!” golf clap. Those New Year’s Day dinners and remembrances are some of my fondest memories from my childhood. Scott Burtness lives in Minneapolis, MN with his wife, Liz and their boxer-pitt, Frank. When he isn’t writing horror-comedy novels about a vampire that likes to drink beer, bowl and sing karaoke, Scott enjoys drinking beer, bowling and singing karaoke. … or drop by some bowling alleys or karaoke bars in the Midwest. This short story is from my universe of Carnival Fun. Virna Grant is my alter ego, who I feel I would be if I gave into my every weakness and flaw. The Novel Carnival Fun has also been performed as a play and has received attention to be made into a movie as well. It’s always hard to say what will happen in Virna’s world though and everything is seen through the twisted spectre of funhouse mirrors. The cookies were definitely a little burned around the edges, especially the Christmas trees. This was a consequence of trying to do things myself. I had let the help off for Christmas this year. Well, Bruce had let them off. The truth wasn’t that he was doing it out of the goodness of his heart (although the bonus he gave them made up for his self-serving motives in my opinion), but that he wanted to have a party with Eric and their ‘alternative’ friends and didn’t want too much gossip to get around town after the brandy and eggnog started to flow and people forgot that they weren’t supposed to be couples. I hadn’t thought twice about the idea when my husband had first brought up the idea and I was happy to brush off my dusty home maker skills to have a Christmas dinner and all the goodies made by myself. Eric had offered to help me with the baking but then he and Bruce had gone to decorate the sitting room and decorate the tree. The servants had brought the large Donner pine in before being dismissed for the holiday. They would return New Year’s Eve when they would orchestrate a more traditional and public party- and of course help us clean up from Christmas. By my calculations we should all be recovered from Bruce’s party but the house would doubtless still be a disaster. I would be spending the entire party fetching trays, getting hot and sweaty and being utterly ignored by almost everyone. It was too much to bear and I felt my skin prickling with anger and my lips purse. I stormed out of the kitchen and then remembered I didn’t have anything to drink and so I stormed back in and poured myself a small glass of cherry brandy and drank it. My skin prickling faded as the healthier flush of the booze took over. I steadied myself by pouring another glass. I searched through some drawers for some pills to take as a chaser. I felt better as the warmth of the pills spread through me with the brandy and I stormed out of the kitchen with a clearer idea of how I would distribute my frustration at being so insultingly put into the role of servant to my husband and his gay lover. What was I thinking? I hadn’t been thinking and neither had been Bruce and Eric. W were all just feeling frustrated by being so inhibited and wanted to be with some of the people who also hid their lifestyle choices to please their parents, get inheritances or just fit in with society. None of us had been thinking and now I was stuck with being the Martha of the Christmas party. I found Bruce and Eric adjusting a garland in the living room and I threw myself down on the divan with my drink, glowering at them while Bruce hopped down from the ladder and came over to give me a kiss on the cheek. I pouted but I wasn’t quite up to throwing a full tantrum yet. Eric finished what he was doing and took my glass from my hand, sniffed it and then refilled it with more cherry brandy and kissed my forehead as he gave it to me. His eyes were filled with the knowledge of why I was upset even though Bruce was still happily oblivious to my potential tantrum. That was part of the problem. I liked Eric. In some ways I liked him even more than I liked Bruce. We had conversations that would last all night sometimes while Bruce would be more interested in going out for a jog or playing sports or doing his own researches. Bruce was happy being Bruce and I was not happy being me and only Eric seemed to see anything of how I was feeling in all this. How wonderful it had seemed to be given so much freedom in a marriage, to be able to give my affections to anyone I wanted, so long as we kept the gossip down to a minimum of course, to not have a husband who was interested in me physically but only in my intellect and my company and my presence on his arm. It was hard not to have someone look at me the way Bruce and Eric looked at each other. This soiree of their was making me even more of the third wheel that I really and truly was in this ridiculous parody of a marriage. Bruce looked at me in bewilderment and Eric studiously adjusted some ornaments in a box. His tenderness had turned off like a switch and he was irritated with me. His mouth was doing that pouting thing that some days made me feel like holding him like he was my own small child and other times made me feel like punishing him into a less self-indulgent man. Today was the a case of the latter. Eric turned back to us. He opened his mouth and closed it. I wished he would just talk. He was often so shy and I knew that he was in an even worse position in many ways than I was. Eric was a lawyer with another firm and while Bruce was secure as a married man, Eric was still a bachelor and older than Bruce. With his gentle manners and quiet voice he had only his dignity to stave off the gossip that inevitably circulated about unmarried men who weren’t frequently seen with pretty young things dangling off of their arms. He maintained an apartment where he ‘lived’ separately but he only used the place when he was forced to entertain. Eric didn’t really have a life of his own, he was more like me in that way, just a satellite orbiting Bruce’s life. Wee both only influencing the tides while he held us in his gravity. I drank my cherry brandy and wondered how much I was willing to fight with Bruce about the party. Bruce was annoyed with me and I could see that he had a moment of sheer rejection of the idea and then Eric put a gently hand on Bruce’s shoulder, one finger gently tracing along his hairline. I watched the tension drain from Bruce and he smiled and nodded. “Sure, sure, give them a call, there’s no reason not to,” Bruce kissed my cheek and went back to his garland. Eric gave me a wink and returned to helping Bruce. I finished my brandy in a swig and decided that I could still feel up to decorating the cookies when they cooled. I thought it would be a long stretch to see that I felt included but at least I didn’t feel ostracized. I would call Brian and see if he and Jeffrey could help out. They were nice and I got along with Brian’s wife who was in a similar position to me but had been doing it for much longer. Anna had a stream of seemingly younger and younger men on her arm every time I saw her. I thought I’d be up to making some eggnog too- my own Mother’s recipe- she had had her cross to bear in life as well although it was much different from my own. I could still recall her serenely drinking it with pale hands that trembled even though her lips smiled. Bruce and Eric were my family and it was Christmas. My own pale fingers trembled withn the cherry brandy and its small yellow chasers and the pent up tears that I had no right to shed. There were beautiful presents for me under the tree and my husband loved me, even if he had never loved me. Really, I had nothing to complain about as I made my face serene and stirred the nutmeg into the eggnog. Virginia Carraway Stark is a Canadian author and screenwriter who lives in British Columbia, Canada. Her scripts have been made into movies (BlindEYE and Truth and Wine) and online podcasts (Candid Shots of the VPD). Virginia has written several dozen well-researched blog articles about cutting edge biochemistry and health topics for wellness websites and pubmed.com. In addition, she promotes the remarkable turnaround of the African country Rwanda with My Rwandaful Blog, where she educates readers about everything from mountain gorillas to murderous lakes. Currently, Virginia is editor in chief at StarkLight Press, a leading Canadian publishing house devoted to science and speculative fiction. She promoted her new novel, Dalton’s Daughter, as well as her short story anthology Tales from Space, at VCON (Vancouver Science Fiction Convention) this year to great acclaim. In addition to introducing VCON audiences to her alien race the Gendlers, Virginia also picked up her Aurora Award Nominee Pin. Both aforementioned works center around the Galactic Armed Forces Science Fiction Universe, the immersive and open-ended worldscape loved by fans all over the world. Virginia Carraway Stark is co- creator of this universe, and co-editor of its online incarnation the GAF Mainframe. Virginia has also written stories for StarkLight Volumes 1, 2 and 3. These fascinating anthologies compile the winners of StarkLight Press’ short story contests, which are open to first time, fresh authors from all over the world. In between writing projects, Virginia finds time to record excerpts from StarkLight Press’ catalogue on YouTube and runs online writing and poetry workshops. She resides with her husband in the country, where they are surrounded by several dogs, waterfowl and a small herd of goats. 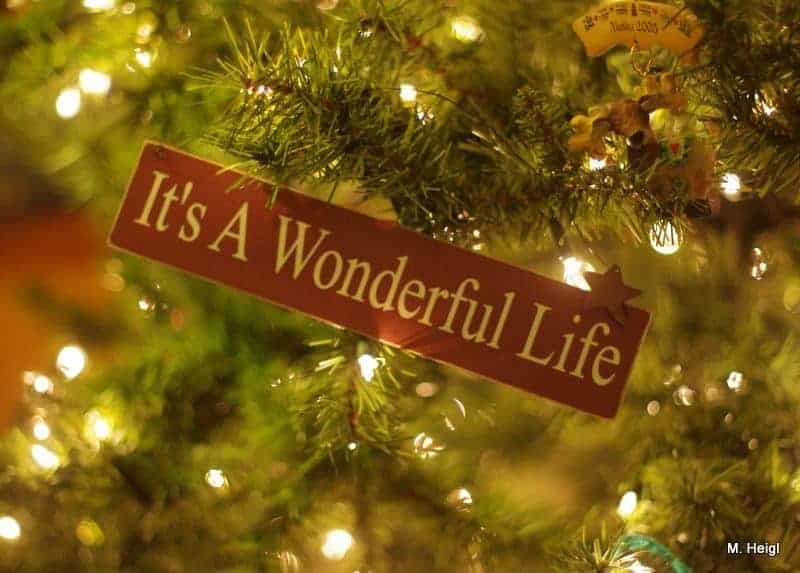 Nearly every year of my life, my immediate family has gathered on Christmas Eve, invited friends and pseudo-adopted family, eaten ourselves silly on shrimp and brownies and cheese balls and red and green M&Ms, and watched It’s a Wonderful Life. “That old hack of a film? Really?” you ask. If you asked it silently to yourself, read on, and I’ll explain. If you asked aloud, there’s the door over there. We don’t argue about It’s a Wonderful Life. It’s a story about a man enslaved to duty, bound to his family by love and his job by honor, feeling trapped and resenting not the people but the circumstances. It’s about finding the delightful and unexpected in the commonplace, where the girl you ignore on the street everyday can be the gorgeous girl of your dreams when you finally notice. It’s about giving up your youthful dreams and yet finding joy in the life you’ve made. And it was allegedly Jimmy Stewart’s favorite film, too, and who can argue with that? It was a relative flop, fairly unknown until its copyright expired and it became cheap fodder for television stations seeking seasonal filler — a miracle both in script and real life. The film slipped around the contemporary Hays Code (that #*&%@! Potter never gets punished), provided the names of friends Bert and Ernie for generations of happy Sesame Street fans, and managed to make a hero of a man who screamed at his children while smashing the house. It’s good for writers, that way — we see George Bailey save his brother’s life (losing his hearing) and the life of an unknown boy (taking a beating in front of the girl who likes him), give his college funds away, give his honeymoon funds away, and save the town’s only independent financial institution at the cost of his own dreams, so by the time he’s breaking stuff and shouting, we’re on his side, because we know what it costs him. But who cares about story technique? We’re watching the movie. And it means Christmas lights and carols and food and friends and family, and while I’m not usually bound to tradition, this is one tradition I refuse to give up. And if any philistines watch the colorized version, I shall banish them to Potter’s Field (the best-named housing development ever, I suspect). There are other Christmas and seasonal movies I love, too, but It’s a Wonderful Life is our family’s signature film. I wanted to offer all my blog readers a gift of some sort today but I couldn’t decide what, then it came to me, the perfect solution. Niteblade! Niteblade is only partway to our sales/donation goal. Once we reached that goal we would release the web-based version of the latest issue free for everyone to read… but if I were to release it early, well, that would be a gift for all my readers, all Niteblade’s readers and all the contributors to Niteblade whose work will be readily available to be read. Win/win/win! So Merry Giftmas. On behalf of myself and everyone at Niteblade, I’m pleased to announce the latest issue is available to read online now. Enjoy! (Or, since it’s Christmas, maybe bookmark it to enjoy later! This year I invited people to share their Christmas traditions on my blog. Virginia is one of the contributors to this effort who went above and beyond in her sharing. What follows is an extremely personal story that may just touch your heart. I know it touched mine. Thank you for sharing it with us, Virginia! Every holiday season I am very aware of the expectation of the holidays. Whether I am having a large Christmas or a small one, if I am on the road travelling, in a foreign country or in my own home, I am aware that it is the expectation that I have of compassion and sharing and togetherness that is of the prime import. This is my own Christmas miracle that happened when I was a child. I try to pay it forward anytime I can to people I see struggling during the holidays. I’m not a saint but the belief in the kindness of our fellow humans is what we all really want to be at the heart of our holiday season. There were a lot of things like that with my mother but the hard thing was the big incident that taught me how arms’ length I would have to be with her. It was only after I understood how she felt about her own abuse and her mother that I forgave her for that Incident. It’s easy to get confused with abuse and easier still to lash out at others and she didn’t have my ability to focus on the positive. She was the opposite of me in that way… to her the world was darkness and despair. She had a good heart though, she had a wonderful openness to her and it was mischance and ill fortune that every choice she made with love in her heart went badly for her. You see, she had wanted to get away from her dad more than anything else in life when she was a girl. He wasn’t like my Dad- her father was unpredictable. My Dad had rules and if you obeyed the rules you wouldn’t be disciplined. There were a lot of rules but I took it as a challenge and I regarded it as a deep failure on my part if I was unable to remember them all or was physically unable to meet up with them. I would push myself to the point of unconsciousness rather than fail my dad while I had a drop of strength left in me. Her dad, Dennis, was like a pot that’s on the back of the stove of life and is constantly boiling over. You could try to keep the burner set to low but the least little thing would set him off. I recall one family Christmas Eve going to his house, the table was set with margarine and butter. Dennis asked for the butter and someone (I think it was my brother) passed him the margarine instead. I feel I should also mention at this point that both butter and margarine were unlabelled and were little squares of nearly identical yellow grease. They were slightly different yellows and that was the only difference as they each sat on little cut crystal plates. Of course, for a normal person, getting the margarine instead of the butter would be the smallest of incidents, but not for my grandad. He took the saucer, started to slice of a wafer of margarine and, muttering something that I think was, ‘that’s not butter’. He picked up the outed margarine and threw it across the dining room and then threw the crystal plate behind him like a discus as he stood to his feet and hit the table with his rising lap and knocked over his chair behind him. He started to roar and rage. He ranted about ‘idiots’ who couldn’t tell the difference between margarine and butter while throwing plates and turkey around the dining room. My Dad scooped me up in his arms and my mom grabbed my brother by the shoulders and they evacuated us as quickly as they could to the truck. My mom held onto my brother and my brother clutched me while our brave dad went back into the house amidst the sound of breaking china and incoherent ragings and extricated all of our presents. The truck was full of presents and it was Christmas. We weren’t going to enjoy the tree, we weren’t going to have the rest of our dinner. Dad drove us to a motel and held my mom while she cried. I remember the two of them, sitting in the window of a cheap motel, him perched on the arm of the chair while my mom wept exhausted and ashamed tears. Dad helped her to the bed where she passed out and then he left without barely a word to my brother or me. Leonard and I sat together in the window. He was kind to me that day, he was very impressionable and I noticed that he usually treated me as an exact replica of how he saw my dad treat my mom on a moment by moment basis. We talked a bit about what had happened but mostly we thought about all the presents in the back of the truck getting covered by snow. He held me the way he saw dad hold mom and we sat in the window watching the growing snowflakes until we fell asleep in the chair. I’m not sure of when my dad returned, but when we woke up we saw a Christmas miracle. There was a little scrawny Christmas tree on the coffee table in front of the window and the presents from the truck were mounded up around us to nearly fill the hotel room. Some of them were damp from snow but we didn’t mind. There was a little tinsel on the tree even though there weren’t any other decorations and there as the smell of fried chicken and cranberry sauce in the hotel room. It wasn’t an ideal Christmas but it was the sort of magic that my dad could make happen when he wanted to. Sitting on the hotel bed as a family and eating take out food we all laughed at grandpa the way people always laugh at the monsters that scare them. Leonard had a bruise on his face where something grandpa had thrown had hit him and he imitated grandpa’s anger after seeing Dad do it. Mom and I laughed as the two of them mugged angry faces and stormed around the room, throwing the wrapping paper that we had left all over the room as though it were crystal plates. We never went back to grandma and grandpa’s house for Christmas dinner ever again after that. It was a relief because you never knew what would happen. Dad rescued us all from it by simply saying, ‘That’s not the sort of Christmas I want for my family’. When I think about Mom and the fact that she grew up with that man and there was no escape for her, then I learned compassion. Shemmer awoke in the middle of the night, cold and shivering, and a little disgruntled about having been woken. At least when she was asleep she didn’t really feel the cold. She pulled the blankets tighter around her and pulled her hat more firmly over her head. She didn’t know how Summer did this for months on end with little reprieve. She almost understood why her friend was still dating a monster—at least she was warm around him. Shemmer inched herself a little closer to Summer, huddling against her in the long dark—the longest dark of the year—and wondering if maybe it wasn’t cold she was feeling, but a physical manifestation of her friend’s misery. Can telepaths project thoughts and feelings as well as pick up on them? But she realized now what had broken her tenuous hold on sleep. Summer was whimpering in her sleep, and Shemmer wondered if she’d stopped crying at all this night. In the faint starlight, she could just make out the lump of her friend next to her, still clutching that damn stuffy she’d bought for Aurora, hoping for a Yule miracle. Shemmer wrestled her hands out from under the blanket, and fumbled through her mitts to turn on the battery-powered lamp next to her. It was set to dim, but still pushed away the deepest of the night’s shadows so that Shemmer could see more than just a lump beside her. Summer turned over, facing Shemmer and the light, and rolled right into Shemmer, bumping her. “Aurora?” Summer asked, her voice thick with sleep and pitiful with hope. She squinted herself awake, the hope in her voice carrying into her waking expression, but when her shielded gaze found Shemmer, the light went out of her eyes. There was a beat so still it was like the whole of time had ceased, and then Summer began to sob. She slid her arms around Summer as best she could, all too aware that her small size only mimicked the child her friend missed so desperately. Part of her wondered if her presence wasn’t somehow worse. But she simply could not leave Summer to her despair. “I don’t think this darkness will ever end,” Summer lamented. Shemmer squeezed her tighter and wished there was something more she could do. She knew the little girl was the light of Summer’s life. She hadn’t seen the two of them together as much as she would have liked, but Summer always seemed to shine when she was with the girl. Losing her seemed to have snuffed out Summer’s very soul. The cold night pressed in around them, and Summer finally stilled. Shemmer was certain her friend was simply too exhausted to cry anymore, and Shemmer settled in to sleep, just beginning to drift off again, when she felt Summer get up. She watched on as Summer walked out onto the balcony, still clutching that stuffy—the only gift the impoverished woman had been able to afford. Shemmer climbed to her feet and crept out into the night to stand with her friend in the long dark. Fae Contributor Interview: Sidney Blaylock Jr. Surprisingly enough, Faerie Knight started with an idea of gaining mystical powers from the names of full moons and using that power for the greater good. There are names for each of the full moons that vary depending on the source, but there were two constants: Hunter’s Moon and Harvest Moon. I wanted a character that received his power during the Hunter’s Moon and then lost it once the Hunter’s Moon was over. Tide played a huge role in the magical system, but I dialed that back in later drafters. There was always a faerie element to the story—the original antagonist was a Redcap (a malevolent fae who dye their caps in their victim’s blood) along with two trolls. They had stolen a changeling for the Queen of the Fae. That story evolved after I rediscovered Spencer’s The Faerie Queene (which I had read excerpts from in a college class). Using Spencer’s work as inspiration, the story started to fall into place and it morphed into the story that is in Fae the moment I reimagined the Faerie Queen as a force for good in the world. No, I’ve written other things dealing with fairies. I’ve written another short-story about an elven gunslinger called Knight of the Wylde West (tentatively coming out in November of this year). I’ve also written the script for the first issue of a (projected) four issue comic book series entitled, Faerie Fire, which I liken to The Lord of the Rings meets Roger Zelanzny’s Amber series featuring warring factions of Elves for the throne of the Faerielands. I’m hoping to find an artist for this project in the sometime soon, so I safely say that I don’t think the Fae are done with me yet. I like the element of magic and it is the mystical nature of faeriekind that appeals to me. I’ve always been interested in the fantastical and this has translated into a love of science fiction and fantasy. Writing about the faerie allows me to create characters, plots, and settings that are far from ordinary, or like in Faerie Knight, have the mystical and fantastical hidden in our mundane world. It’s that potential that makes faerie stories (or speculative fiction, for that matter) so appealing for me to write. My favorite type of fae would be elves. I was lucky enough to find Dungeons and Dragons early in its life-cycle (when TSR still published the system). I loved the way that they portrayed elves: lithe, quick, preternaturally gifted and able to master whatever they set their mind to do. Slight in build, but strong in heart and character, the elves in the D&D universe (which I later discovered was an evolution of Tolkien’s elves from his works) were the model to which I aspired. If I may be allowed to expand my definition of fairy characters, I really like the way Legolas was presented in The Lord of the Rings movies—Orlando Bloom’s interpretation of the character is pretty much exactly how I envisioned elves when I was a child in the eighties. Not only was the fighting style of Legolas and the other elves impressive (able to switch from bow to blade and back to bow seamlessly and effortlessly), but the etherealness and otherworldliness shown in the movies makes me wish that I was twelve years old again. The barrel scene in The Hobbit: The Desolation of Smaug exemplifies the deadly grace of the elves while maintaining their aloofness and dashes of wry humor that makes them seem so alien. Not as creatures who are real. As a child, I loved mythology. I checked out any books on myths and legends that I could from my local library. It didn’t make any difference to me whether the myths were Greek/Roman, Norse, or even Egyptian—I pretty much read it all. However, I never believed those myths; my mind automatically categorized myths and legends as stories. When I read about faeries and the fae, my mind filed them into to the myths and legends category. So, to me, the Fae became stories that I can now draw upon as inspiration when I’m writing speculative fiction. On any other day, he would not have dared draw Silverthorne in public, but this being Halloween. Thomas felt confident that the blade would simply seem like part of his costume. He was dressed in a flowing black coat that reached down to his ankles and wore a dark tri-cornered hat which gave him a decidedly seedy look. The long black cloth mask that covered his nose and mouth completed the costume and made him look thoroughly disreputable and menacing, as was his intent–his costume was that of a highwayman. He stalked two trolls as they swaggered through the streets of suburbia. They had thick grayish skin and large unblinking eyes, like sharks. Their faces were thick and stone-like. They were not mortals in costumes, but fae, members of the Unseelie Court. Kids in costumes and their adult supervisors passed the trolls completely unaware. Thomas followed the pair. He knew that his disguise and the fact it was Halloween would keep them from noticing him. He did have to be careful, however, as his fairy sight touched off a sense of unease in Fae. The last thing he wanted to do was spook these two. Thomas needed their leader. Thomas turned. A tall Chewbacca, escorting Princess Jasmine, pointed to Silverthorne. Thomas turned back to the two trolls, but though his attention had only been diverted for a moment, they were nowhere in sight. He scanned the street, but he saw no Fae, only trick-or-treaters. His heart sped. Too old and too slow, he berated himself. Lives depended on him and he just lost the trolls. They were his only lead to the fae that would probably try to abduct a child tonight and replace them with a changeling. He could not let that happen. ExcerptFaeFae-tastic FridayFaerie KnightinterviewSidney Blaylock Jr.
As I grew up, my dad set an absolute rule: no cats in the house. My parents were pretty consistent about rules and expectations, but on this point my mom disagreed. She let us bring our beloved cats into the house, and feed them, and let them generally have the run of the place. The vital thing was that all evidence—the cats included—be outside before Dad came home from work. Dad was very strict. There was a looming fear that he would take the cats to the pound if we broke his edict. Our outdoor cats were extremely well-behaved in their brief time indoors, especially our cat Adventure. Adventure was more like a sibling than a cat. He was a gentlecat, the very definition of regal. He did not walk. He strolled. He welcomed us home from school and escorted us to the door. His purr could be heard from rooms away. He loved being carried like a baby, or perched on a shoulder, or cuddling in a lap for hours on end. In the summer time, with me and my brother home all day, Adventure truly ruled the roost. Which leads me into my Christmas story. I always set up our artificial tree the day after Thanksgiving. We were always excited for that Monday after, for the official “blessing of the tree.” Adventure would amble inside, sniff all the lower branches, perhaps attempt to gnaw on one or two. He would then make a perfect nest on the white cotton blanket beneath the tree. He was like a perfect tabby pillow, formed into a cozy circle. We took pictures of him like this some years, and always took care that we developed the film and Dad never saw it. I have always loved Christmas. I often started making crafts and buying gifts early in the year, so once the tree was up, I had ready things to wrap and place beneath the tree. I made sure that there was a space for Adventure to make his nest right among the presents. One day, Dad arrived home from work. I can’t recall if he was early, or if we had simply been doing other things. But right away, we realized we had a problem. “Did you get the cat?” Mom whispered. “Did you get the cat?” I asked my brother. “No, did you?” he asked. Dad had walked right in the front door, with the tree and sleeping cat not two feet away, and passed right on by! Dad went to the bedroom to change out of his work clothes. My brother yanked a very surprised, sleepy cat from under the tree, and I held the garage door open so they could make a quick exit. Our beloved cat, always a gift and blessing, had appeared as just another present beneath the tree. For us, that was very much a Christmas miracle. Beth Cato is the author of THE CLOCKWORK DAGGER, a steampunk fantasy novel from Harper Voyager. Her short fiction is in InterGalactic Medicine Show, Beneath Ceaseless Skies, and Daily Science Fiction. She’s a Hanford, California native transplanted to the Arizona desert, where she lives with her husband, son, and requisite cat.